Your CV has knocked the employer’s socks off and you have an interview. 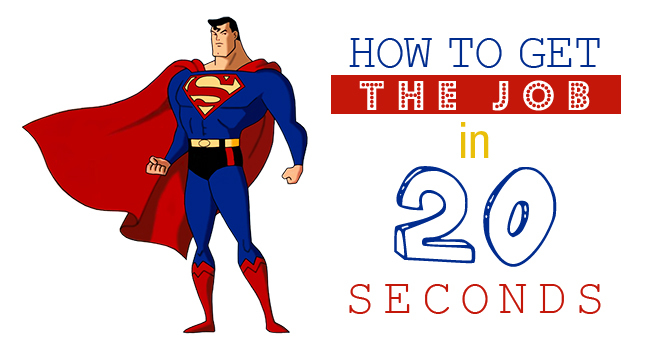 Here are some tips on how to get the job in 20 seconds! The first tip to get the job in 20 seconds is preparation. Before you step into the employer’s office, you need to be able to know who they want, what they want. Most importantly, you need to know why you are the best candidate and how your experience only confirms this. If you don’t know the answers to these questions and express them during the interview, the interviewer will possibly leave the interview wondering why they asked to see you. This information can usually be found on the person spec, job description, websites and social media, so be sure to have your research cap on and take notes. This also gives you an opportunity to see if you would like to work for the company. Before you enter the building and the interviewer introduces himself, take a deep breath, confidently walk for 20 steps, give a firm handshake and look them in the eye, smile and introduce yourself. In those first few seconds, the interviewer is forming an opinion of you before you have sat down, so give them the best you and make them want to give you the job. After all your hard work, you deserve it! Sometimes it’s not what you said but what you didn’t say that didn’t get you the job. In his book Silent Messages, Professor Albert Mehrabian says 55% of communication takes place through body language, so it is important to get this right in the first 20 seconds. If an interviewer walks in and sees you staring into space, slouching or even yawning, their immediate perception will be you don’t want to be there. If there are other candidates waiting, try starting up a conversation and finding out about them. If the interviewer sees you are engaging with others, they will instantly see you have good communication skills, confidence and that you want to be there. If you are sitting on your own, make sure you are sitting upright, attentive, reading things on the walls or a relevant book. Make sure you keep a half smile so you appear approachable. Remember, you are also a stranger to the interviewer. This entry was posted in General Posts and tagged get the job, how to get the job, interview advice, interview questions, interview tips. Bookmark the permalink.